Hello, I have a super, special treat for you today, my Salted Caramac Centre Toffee Cookies. 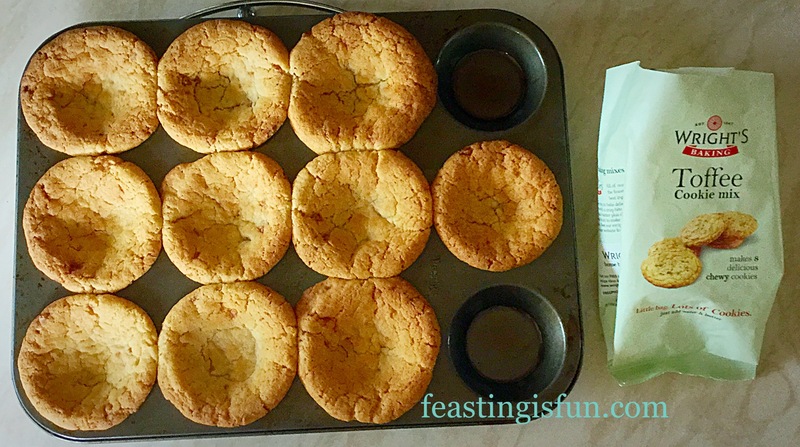 Salted Caramac Centre Toffee Cookies are so easy to make and such a treat to eat. 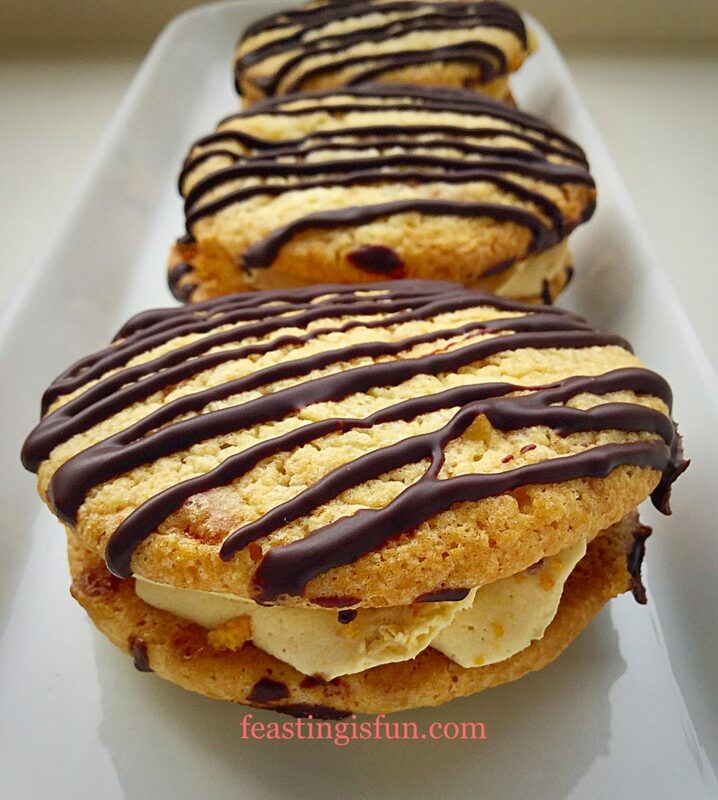 Whipped, light, salted Caramac ganache, with a sprinkle of honeycomb dust, sandwiched between two toffee cookies. Oh and then finished with a dark chocolate drizzle. 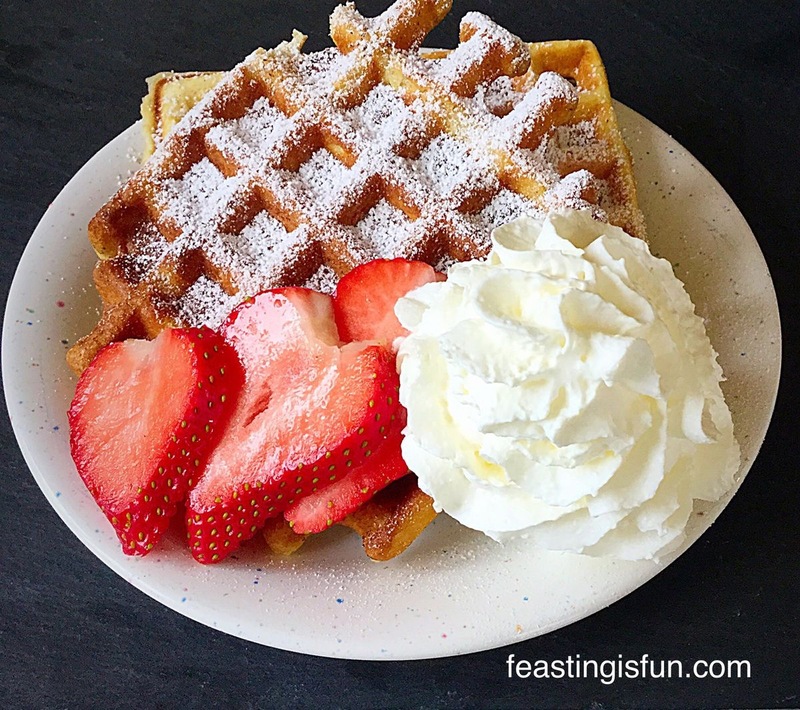 A complete flavour festival ready for you to bite into! 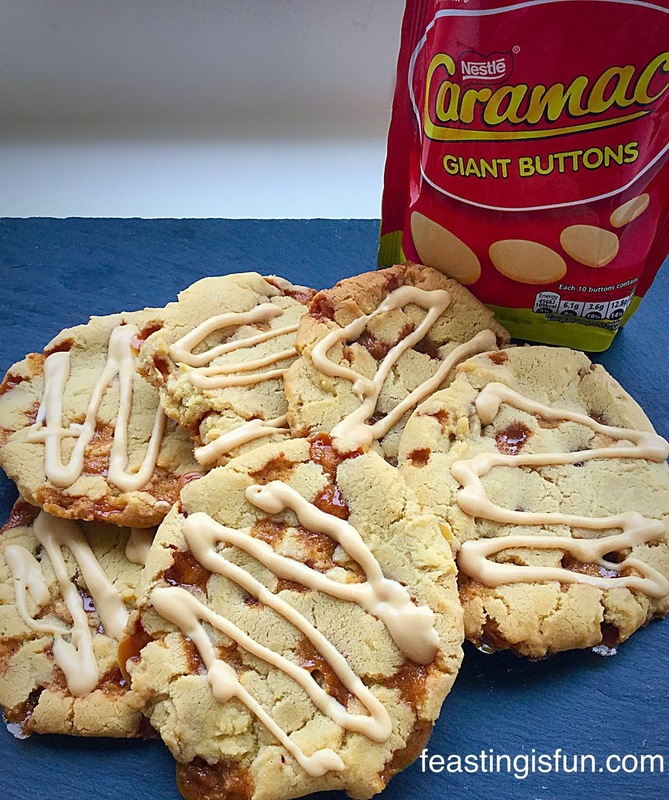 Salted Caramac Centre Toffee Cookies a flavour party in your mouth! I love eating these sandwich cookies and that comes from someone who, until now, did not have a single salted caramel recipe on here. I didn’t jump on the bandwagon, I barely like caramel, why would I add salt to it? 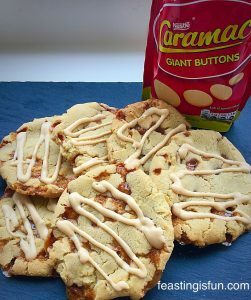 Salted Caramac Centre Toffee Cookies perfect with Afternoon tea or morning coffee. So there’s a toffee cookie base with swirled, salted Caramac ganache on top, a sprinkle of honeycomb dust, topped with another toffee cookie and finished with a chocolate drizzle. 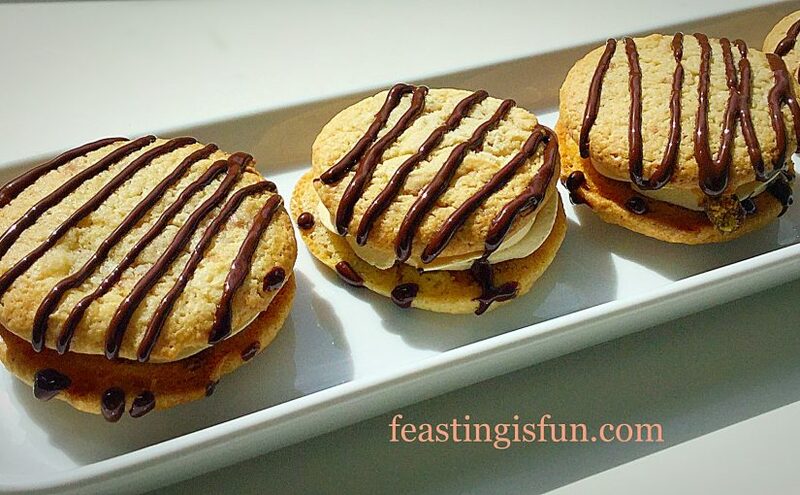 That’s how these cookies stack up and believe me, they are a beautifully light, indulgent treat! Salted Caramac Centre Toffee Cookies with Wright’s Baking. More like sandwich biscuits, these Salted Caramac Centre Toffee Cookies are perfect on their own, or with a relaxing cup of tea or coffee. Each packet makes 8-10 good sized cookies, as can be seen below. I dipped each cookie in dark chocolate, so that one half was completely encased. 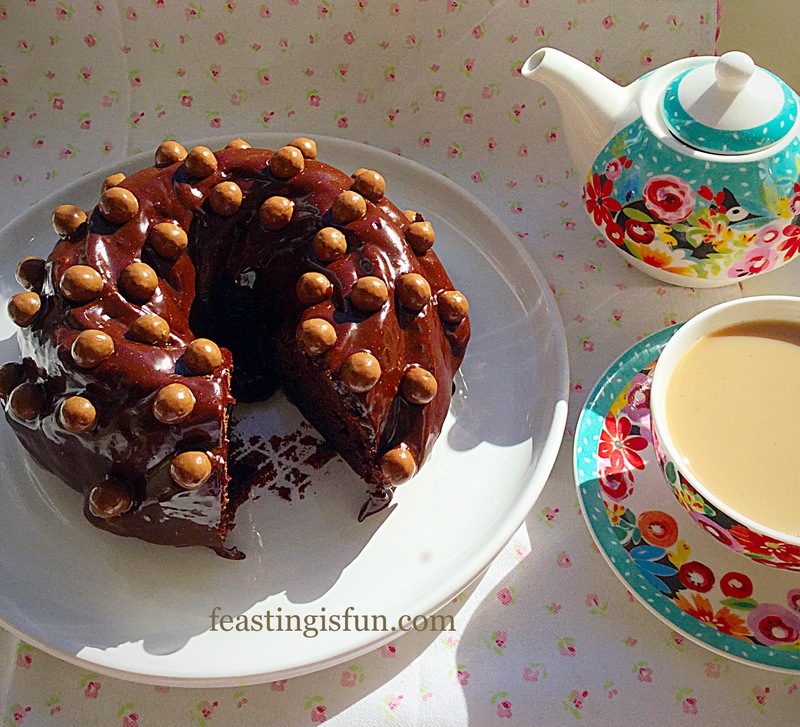 Then I added delicious mini pieces of fudge (which I bought from Asda – in the baking aisle). 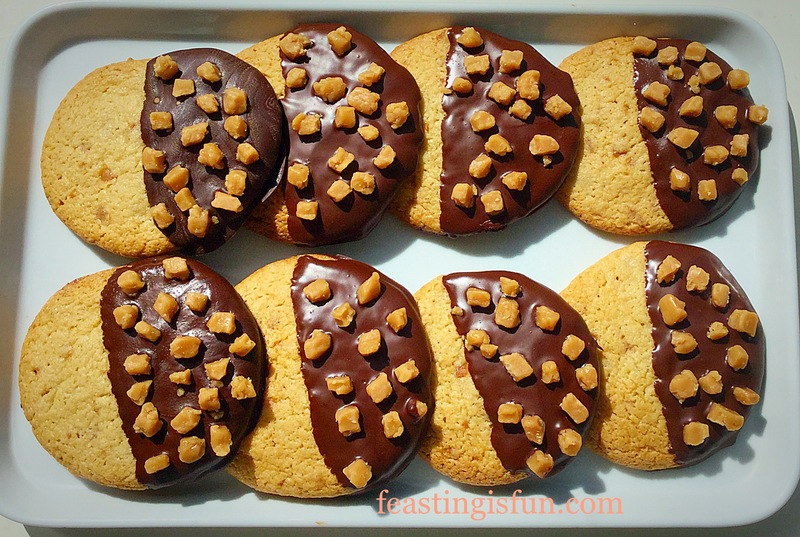 Chocolate Dipped Fudge Topped Toffee Cookies delicious. 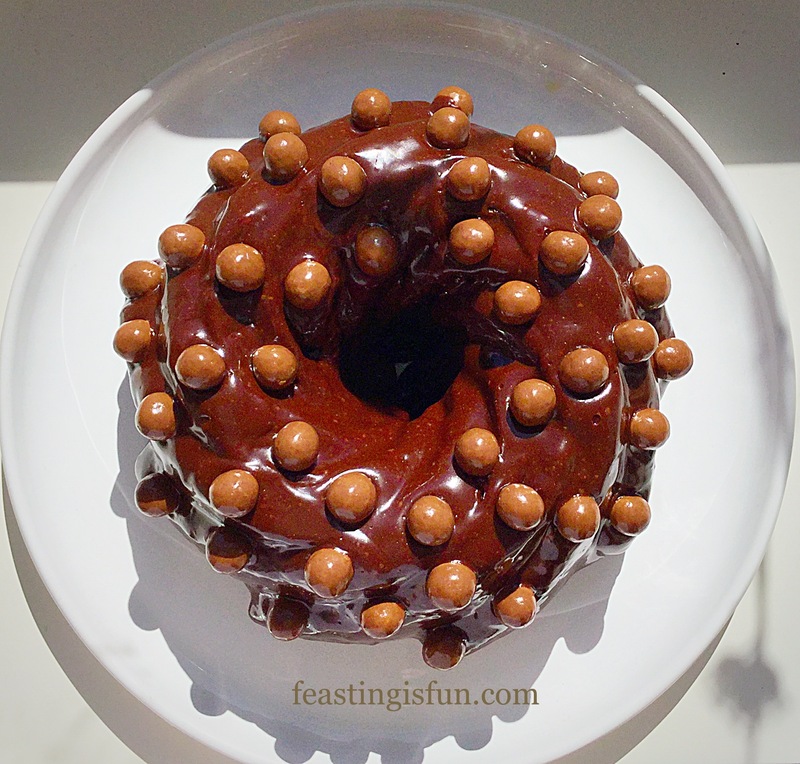 As you can see there are different ways to bake using the Toffee Cookie Mix. 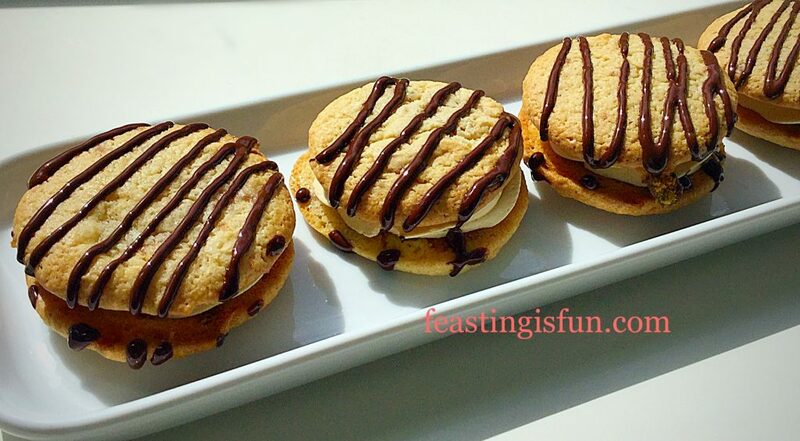 For the smaller sandwich cookies I baked them a little longer as I wanted them to be crisper, more like a biscuit and able to hold the delicious salted Caramac ganache in the centre. Line 2 large baking trays with non stick silicone mats, or baking parchment. Make the cookie mix up according to the packet instructions, including the extra water. 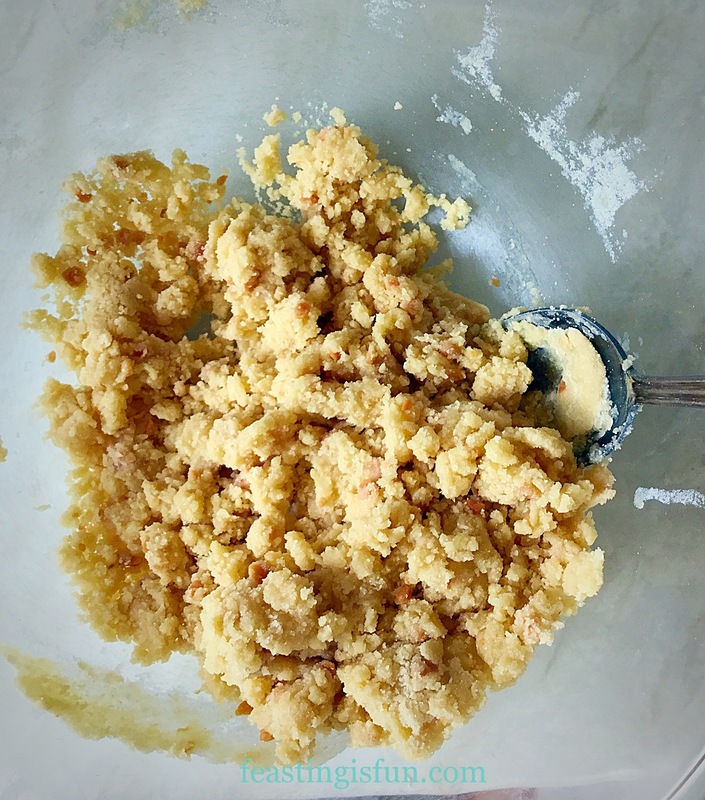 Using a small, truffle sized scoop, or a teaspoon, scoop 16 equal mounds of cookie dough, placing them spaced well apart on the baking trays. Place them in the preheated oven and bake for 15 minutes. 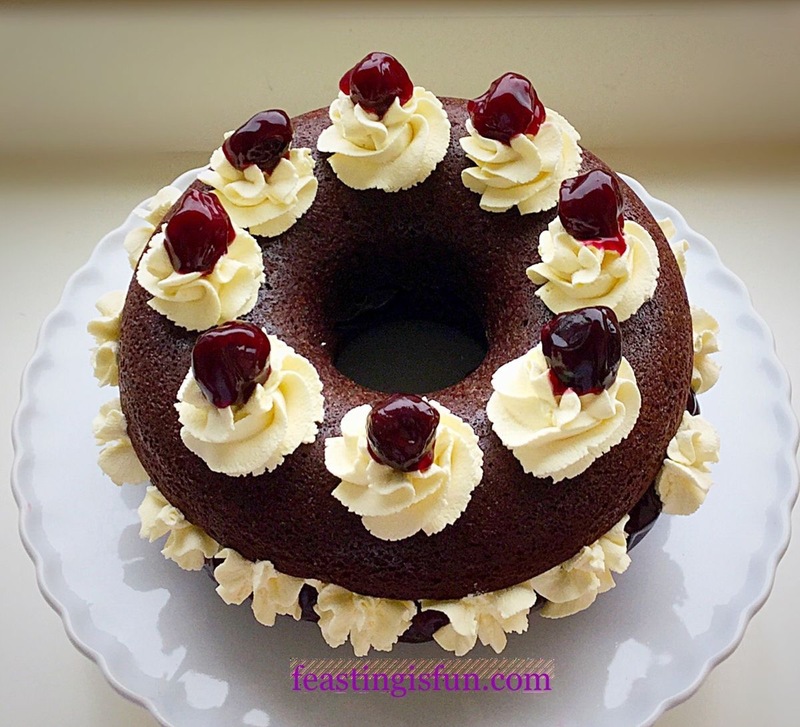 This allows them to bake into firmer biscuits, perfect for holding the delicious centre. Rotate the baking trays halfway through the bake time to give an even bake. Remove the cookies after 15 minutes of baking and allow to cool completely on the baking tray. 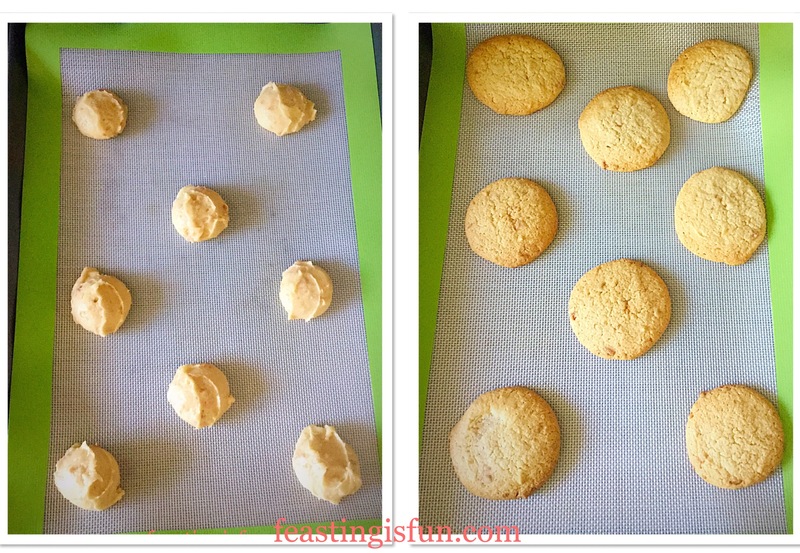 Toffee Cookies before and after baking. While the cookies are cooling, make the ganache. Place the Caramac buttons and double cream in a heatproof, microwaveable bowl. Heat on medium for 1 minute in the microwave, remove stir and heat for 30 seconds more, or until the Caramac when stirred, fully melts and mixes with the cream. Cover the bowl in cling film and place in the fridge to chill. Once the cookies are cooled remove, using a palette knife and place on a cooling rack. Pair the cookies up with similar size/shape partners. Line them up and turn one cookie over so that it is flat side up. Using a rolling pin bash the Crunchie bar inside its packet so that the honeycomb comes away from the chocolate. You want golden dust not chunks! Open the packet and tip the contents into a bowl. 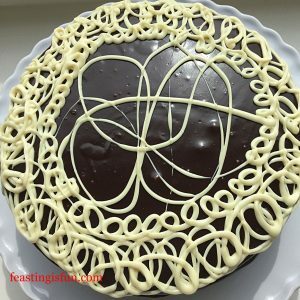 When the ganache is cold, but still liquid add the salt. Whisk the liquid ganache until pale, fluffy and able to hold its shape. Fit a piping bag with a large star tip – I use Wilton #1M and fill the bag with the whipped ganache. Pipe swirls of salted Caramac ganache on 8 of the upturned cookies and then sprinkle with golden honeycomb dust from the Crunchie bar – the chocolate and honeycomb that’s left is great sprinkled on a whipped cream topped hot chocolate 😉. 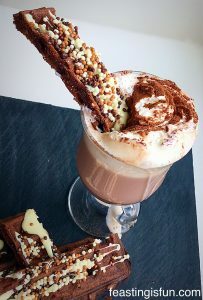 Salted Caramac Centre Toffee Cookies piped, tops and drizzled with dark chocolate. Pop the other toffee cookie on top. 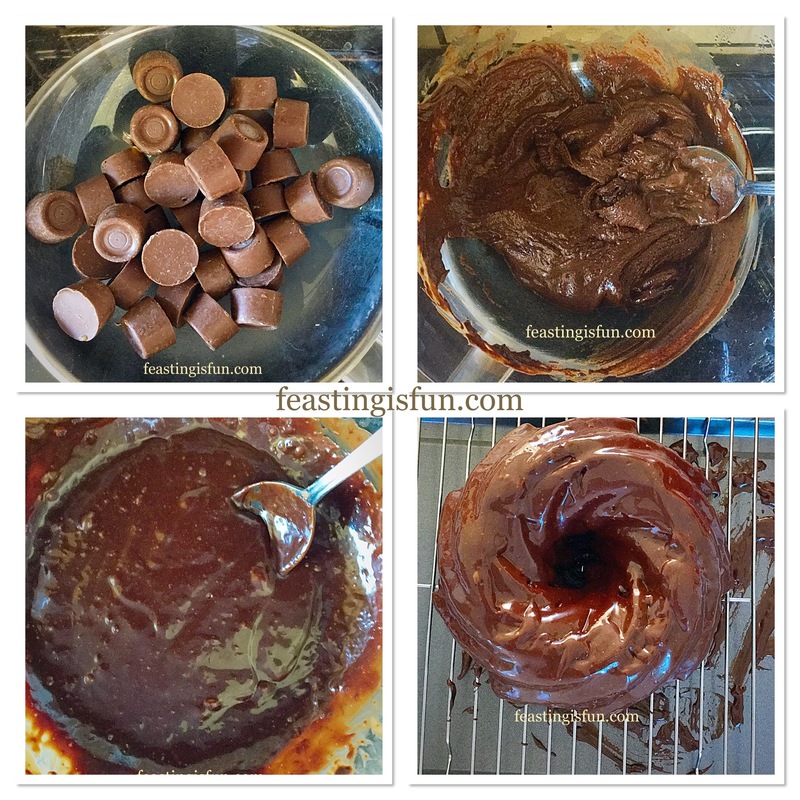 Break the dark chocolate up, heat in a microwaveable bowl until melted. 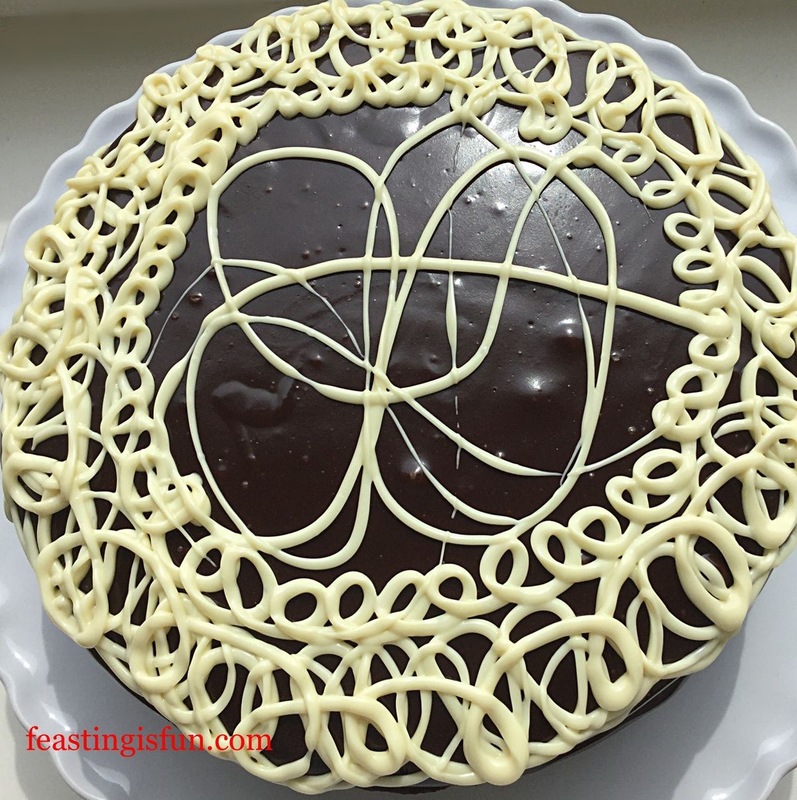 You can either drizzle the chocolate over the cookies with a spoon, or for a cleaner finish, pour the melted chocolate into a small, disposable piping bag. Snip off the very end a pipe zig zag lines across the top of the Salted Caramac Centre Toffee Cookies. Salted Caramac Centre Toffee Cookies these won’t last long! I chilled these delightful cookies in the fridge before serving. 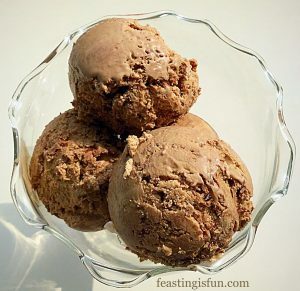 It allows the ganache to firm up and then, when eaten, the centre really does taste like ice cream! 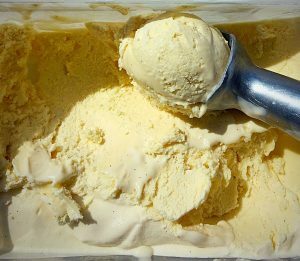 To store, should you have any left over, keep in an airtight container, in the fridge. In fact I am certainly going to make a double batch of these next time. There are 5 of us here at home and sharing is important. It’ll only take a few extra minutes to make 16 Salted Caramac Centre Toffee Cookies 😉. 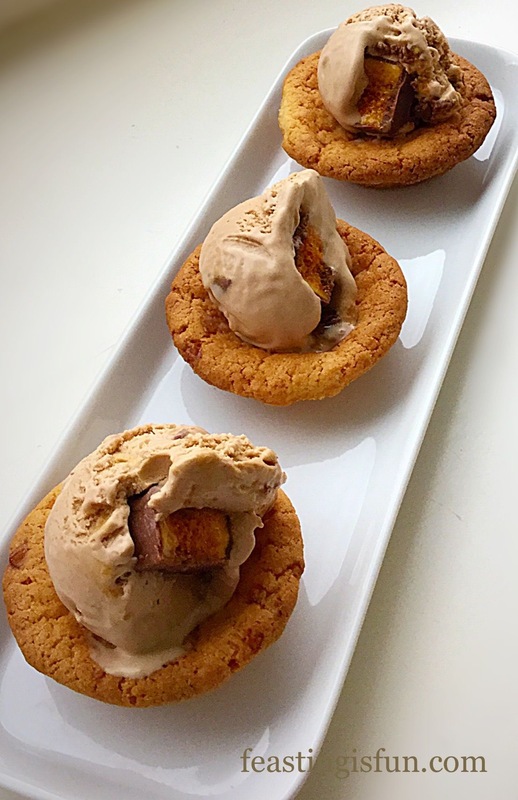 Toffee Cookie Cups using the same Wright’ Baking mix. Caramac Caramel Cookies so good! 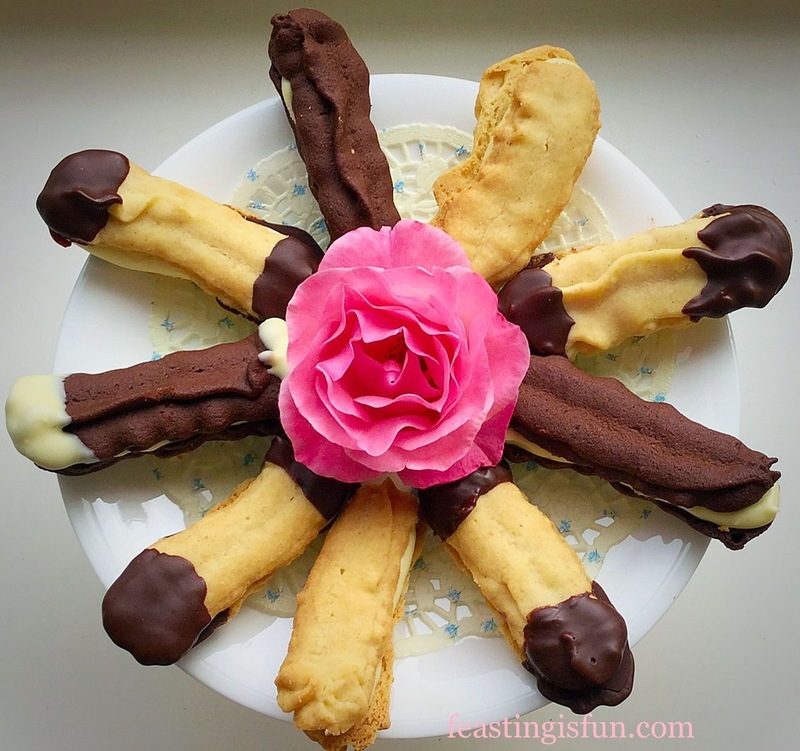 Chocolate Vanilla Viennese Finger Biscuits with a white chocolate ganache filling. 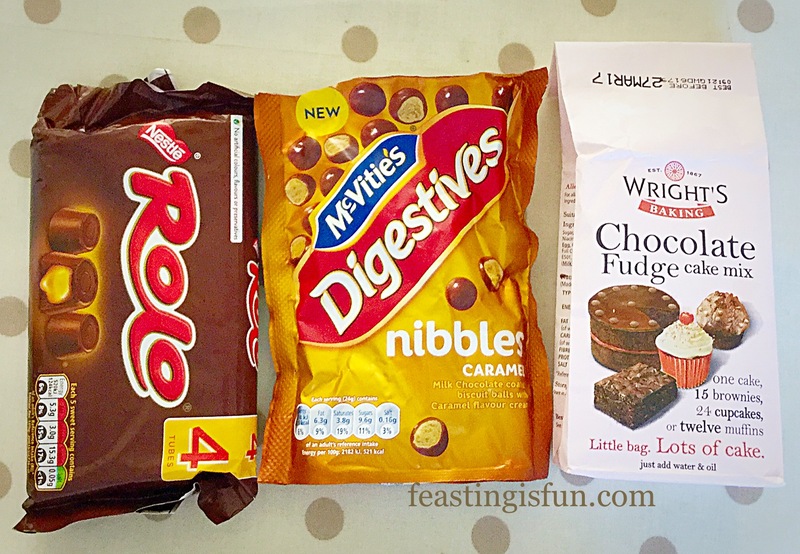 This week has been #BiscuitWeek on Twitter, I’m not sure where else, as it’s always biscuit week here at Feasting is Fun! I hope I’ve inspired you to be creative with your cookies, or biscuits. In my mind there isn’t a difference, however, I’m happy to be proven wrong. 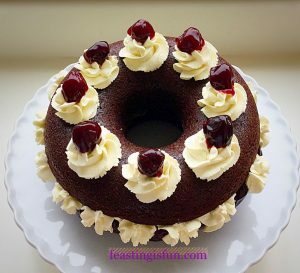 Whatever you are baking, making and creating in your kitchens, I hope you have fun. Enjoy feasting with family and friends as we bid a sad farewell to the Summer, here in the South East of England and welcome Autumn The Most Beautiful Season. Wright’s Baking provided the mix for this recipe, all opinions, views, content and photography are my own. Please see my Disclosure Policy. Over the past couple of days Summer has asserted itself with a vengeance. Temperatures above 30C, blisteringly hot sunshine and clear blue skies. I love Summer and sunshine, but even this has been a little too hot for me. 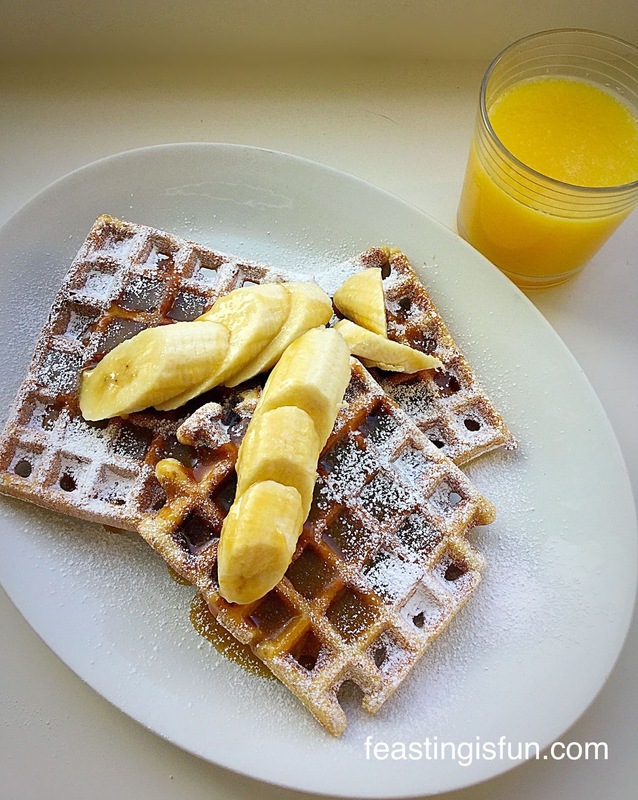 Cooking becomes a chore, rather than its usual relaxing pleasure. So you can imagine how relieved I was to be able to prepare a meal in under 10 minutes. Grabbing a packet of Wright’s Baking parmesan and sun dried tomato bread mix, I came up with this easy Sun Dried Tomato Bread Pizza. Sun Dried Tomato Bread Pizza a delicious twist on a regular pizza base. I also have my own recipe for Sun Dried Tomato Bread, which I’m sure would work just as well. However, I needed an easy, quick prep meal. So thank you Wright’s Baking for yet again coming to my rescue. 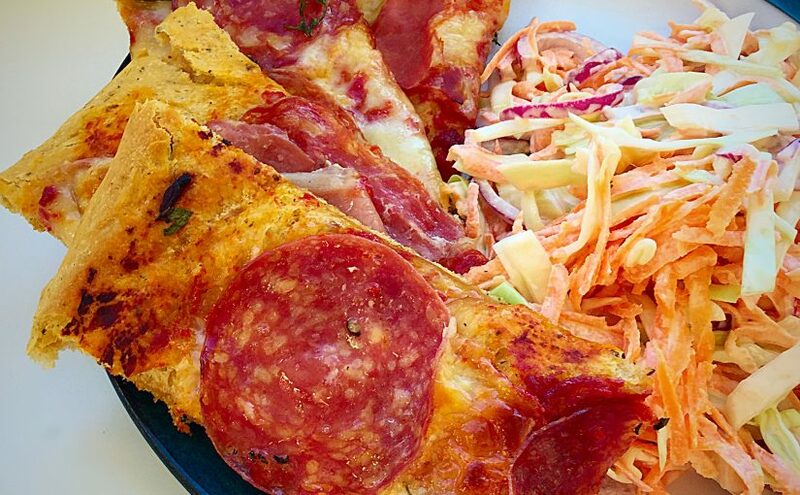 Delicious Sun Dried Tomato Bread Pizza served with crunchy homemade coleslaw. The beauty of using the sun dried tomato bread mix, is that whilst it is mixing, in the stand mixer, I made my Crunchy Homemade Coleslaw. I always keep lemons in the kitchen and I love the way they not only thin the mayonnaise, but also remove the acrid taste from the onions in this coleslaw, which is in my opinion one of the best accompaniments to homemade pizza. 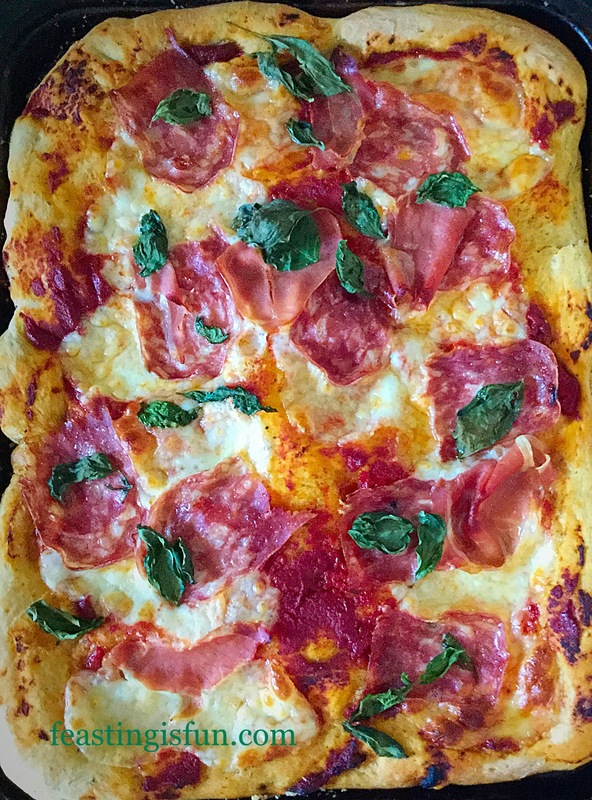 What’s great about making your own pizza, is that you can top it with whatever you like. I had an antipasto meat selection in the fridge that went beautifully with the delicious sun dried tomato base. In fact as well as lemons I generally have mozerella and at least one packet of cured meat in the fridge. 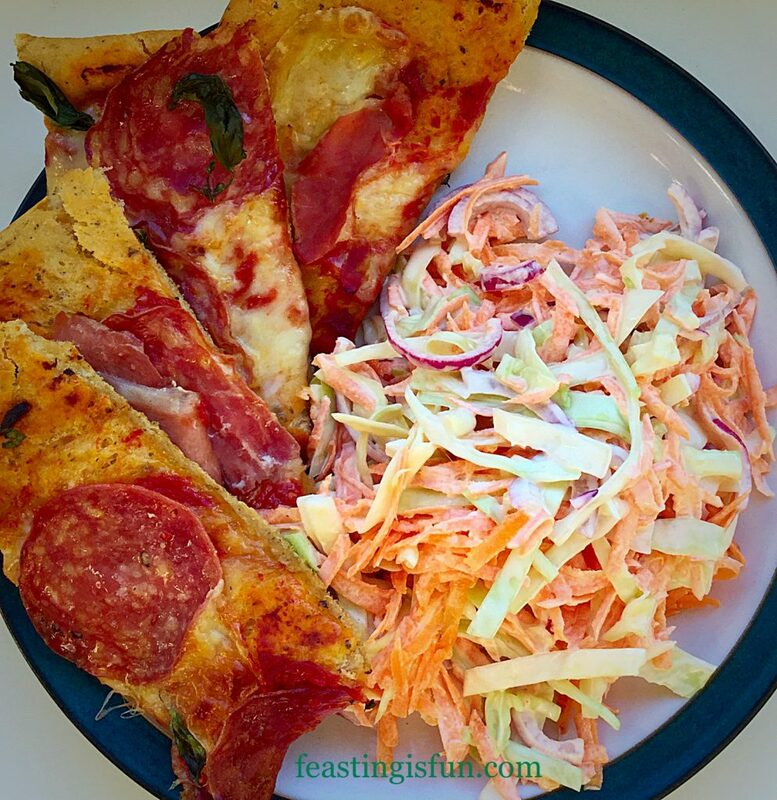 Pizza makes a quick, delicious and nutritious meal, providing it is served with a healthy pile of salad of coleslaw! Sun Dried Tomato Bread Pizza what would you top yours with? I have to mention just how completely delicious the base of this Sun Dried Tomato Bread Pizza is. The crust doesn’t turn jaw breakingly hard, but remains slightly soft with a delicious salty parmesan and herb tomato flavour all of its own. I wouldn’t recommend overloading this pizza with topping as the base is just as delicious, if not more so, than what you top it with. 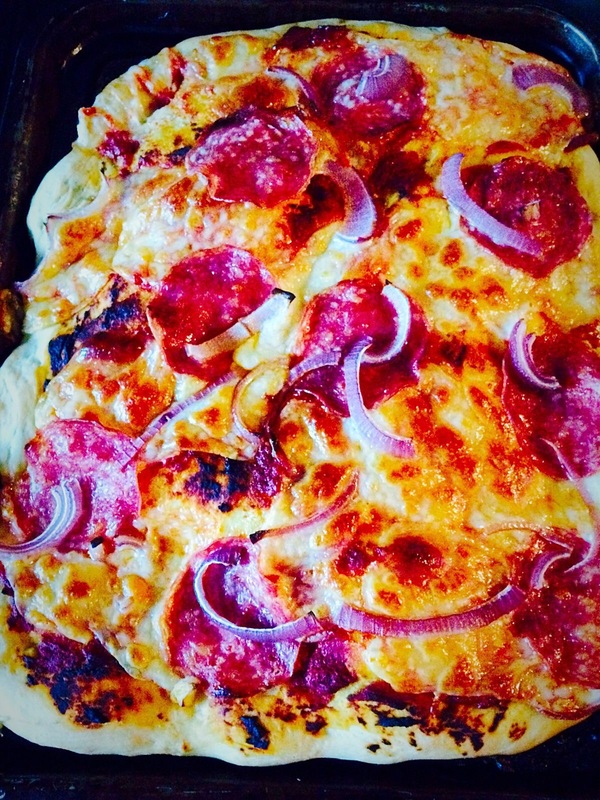 Make this Sun Dried Tomato Bread Pizza with toppings that will work with the tasty bread base. 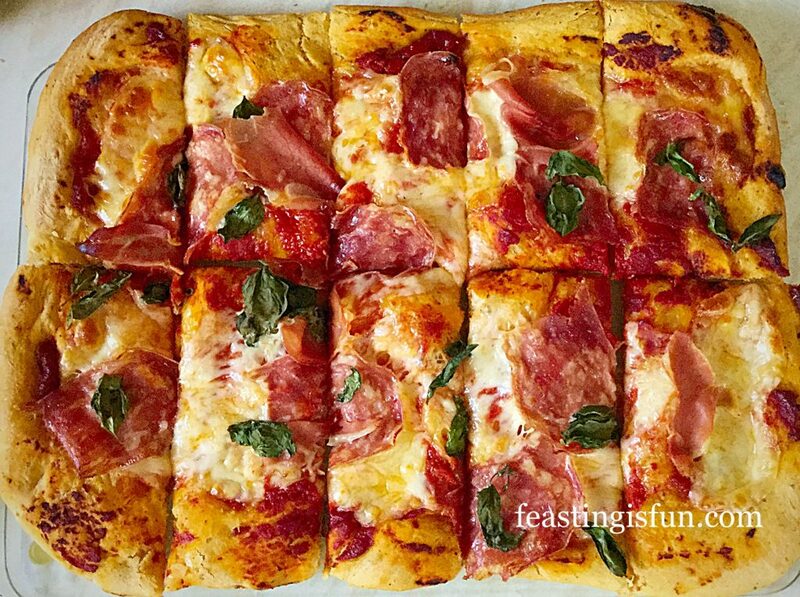 In fact this pizza would be wonderful with a little sauce, mozerella and some basil leaves. The sun dried tomato bread base really is that good. 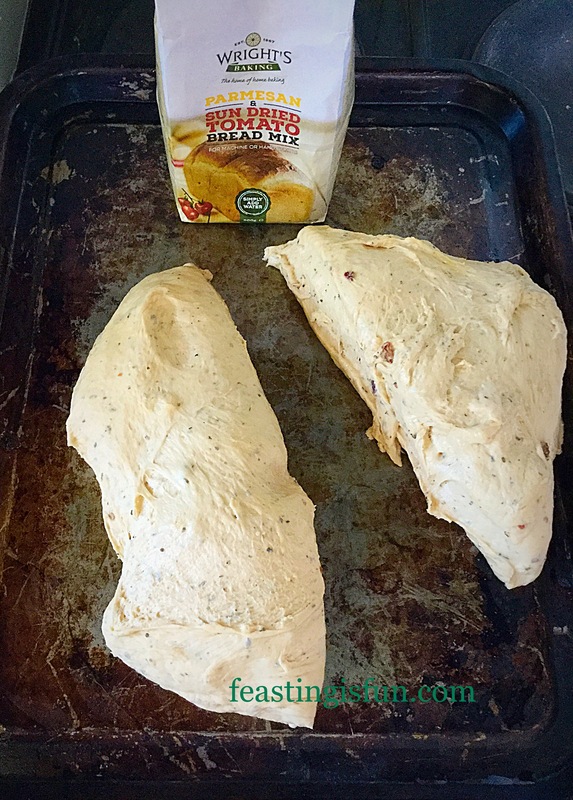 Make the Parmesan and Sun Dried Tomato Bread Mix according to the instructions on the packet. 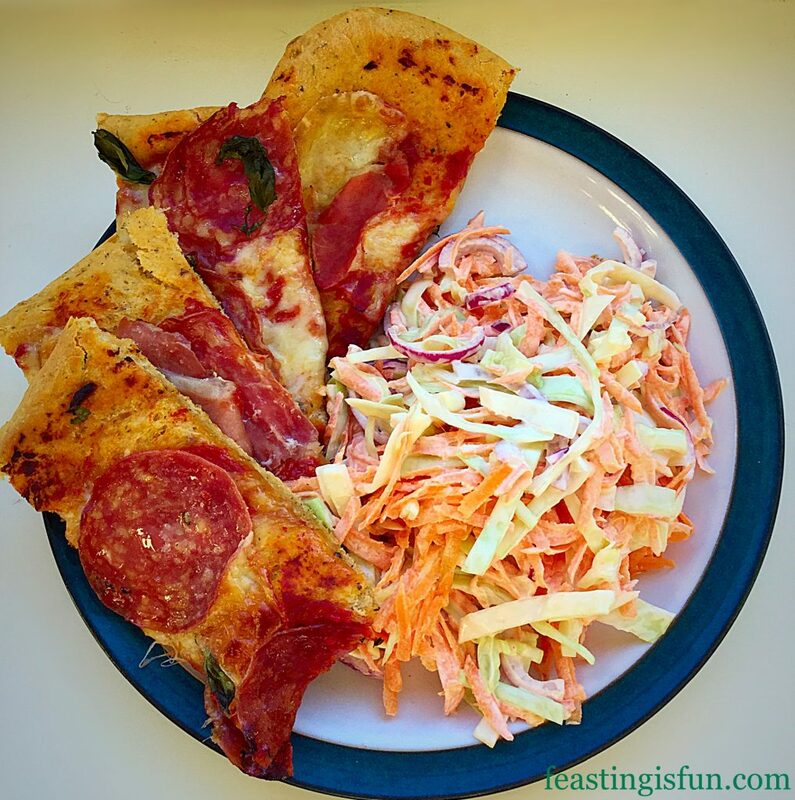 TIP – whilst the bread is mixing make the coleslaw or salad! Grease 2 large baking trays with a little olive oil. Tip the kneaded bread mix on to one baking tray and divide in half. Divide the sun dried tomato bread dough in half. Place one half of the bread dough on each of the oiled baking trays. Rub your hands in a little oil and then gently pat the dough until it is flat and fills the baking sheet. Do the same for the other half of the dough. Add 1 tablespoon of olive oil and 2 tablespoons of tomato purée to the top of each pizza base. Using your hand smoosh the tomato purée and olive oil together so that they cover the pizza base – yes smoosh is a technical term in the Feasting kitchen! 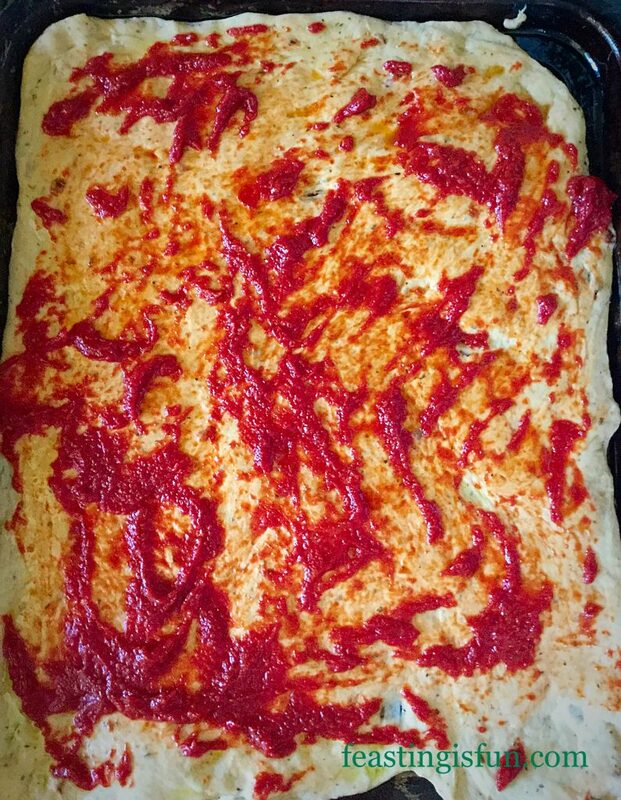 Sun Dried Tomato Bread Pizza base covered in tomato purée. Slice or tear the mozerella and lay on top of the pizza base. 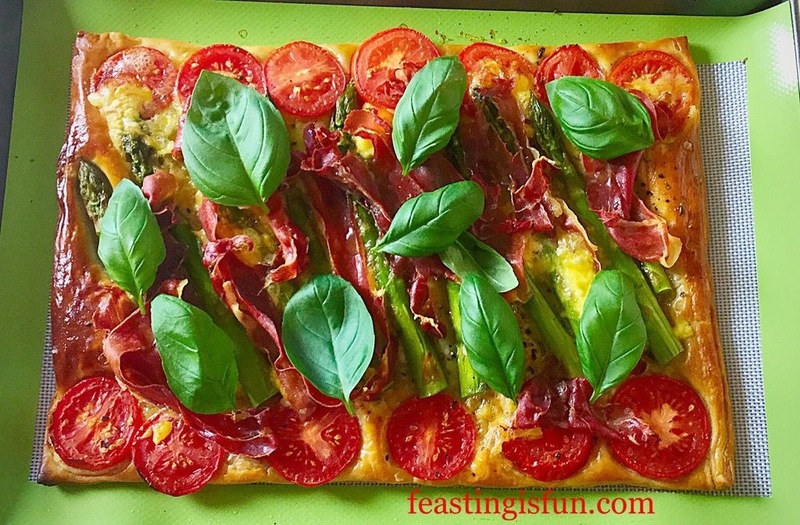 Add thin slices of cured meat and scatter a handful of basil leaves over each pizza. Cover both pizza’s with cling film, or do as I did on such a hot day, pop them into an unheated oven, uncovered, for 30 minutes. This will give them time to rise. Turn the oven heat to 220C/200C fan, gas mark 7. Remove the cling film and place the pizza’s in the oven, if they are not already in there. Bake for 20-30 minutes. The pizzas are cooked when the base is firm underneath. I use a large palette knife to slide under the pizza and lift it. If it’s not quite firm pop it back into the oven for another 5 minutes. 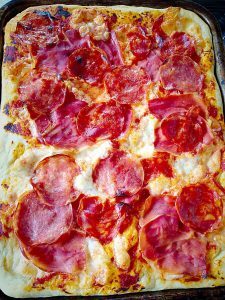 Baked Sun Dried Tomato Bread Pizza with melting cheese and crisp prosciutto ham. To serve, remove the pizza from the tray – I slide it on to a board – and cut into slices or triangles. This tasty Sun Dried Tomato Bread Pizza is perfect for feeding a crowd, as part of a buffet, or served with homemade coleslaw for an easy meal. I really do recommend trying the Wright’s Baking range of bread mixes. Having a couple in the cupboard, even though I make almost all of our bread from scratch, is really handy on hot, busy days! Better Than Take Out Pizza for when you have a little more time. 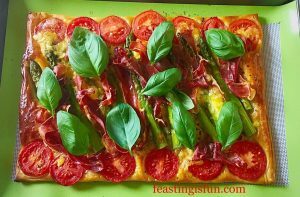 Asparagus Prosciutto Ham Tart easily made with puff pastry. We all need a few quick prep. meals that we can draw on when we either don’t have the time, energy or both to create a nutritious and tasty meal. All of my pizza recipes contain less fat that delivery pizzas. That said, sometimes that really is the only option! Whilst in a perfect world I would have a freezer full of homemade pasta bakes, casseroles and the like, sometimes it’s nice to have a treat. 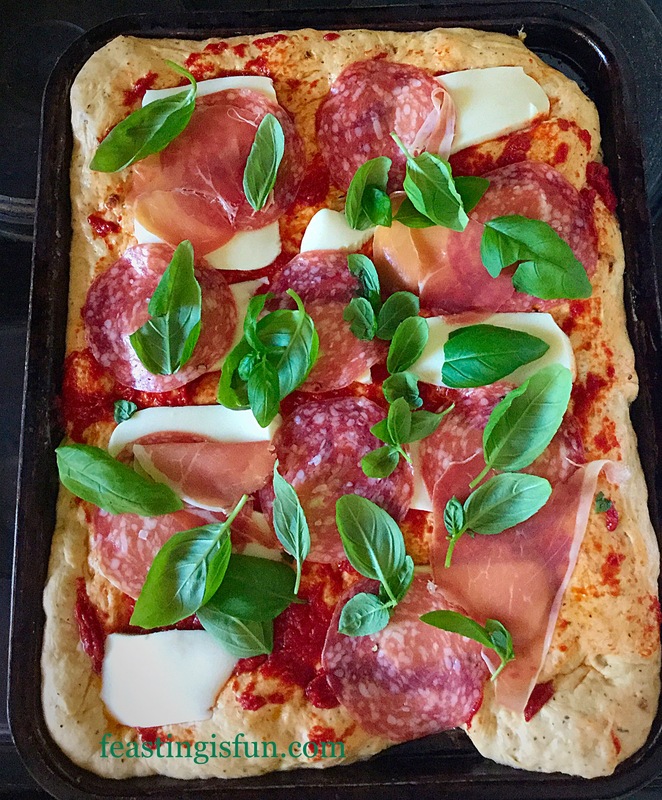 Homemade pizza always feels like a treat simply because it takes so little effort to make and our children are always ready to help. 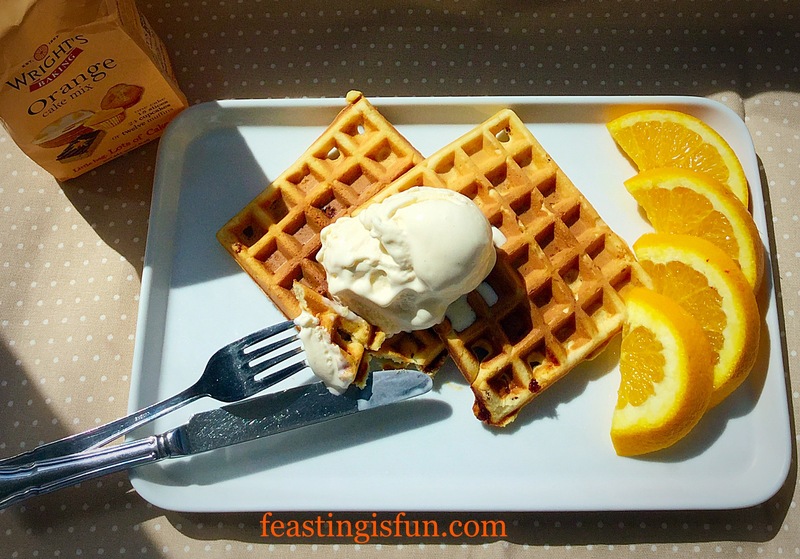 As the weather cools and we rediscover the urge to cook and bake again, enjoy it. 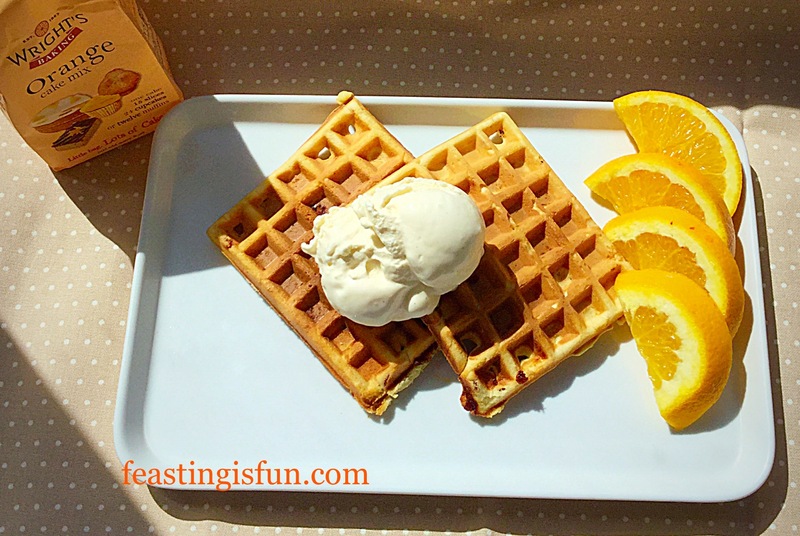 Have fun in your kitchens creating your own very special feasts. Wright’s Baking sent me the parmesan and sun dried tomato bread mix to try. 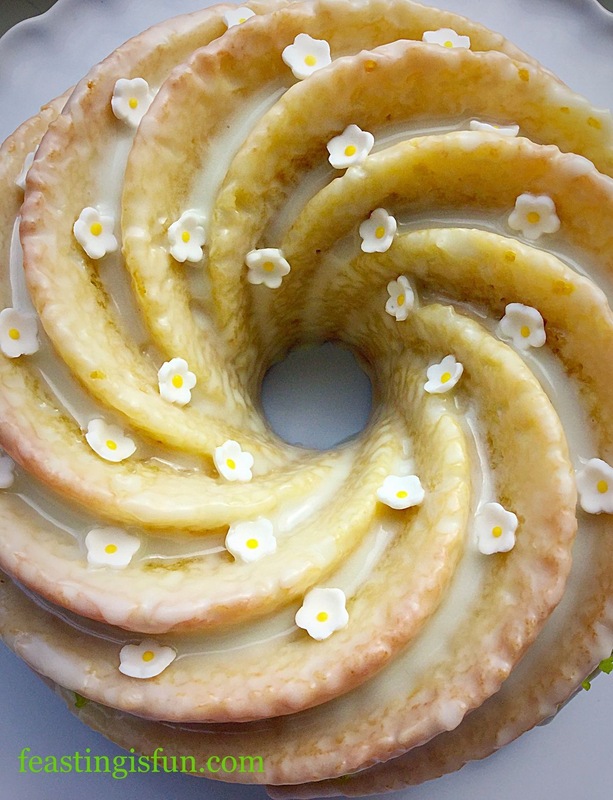 All opinions, views, content and recipes are my own. Please see my Disclosure Policy. 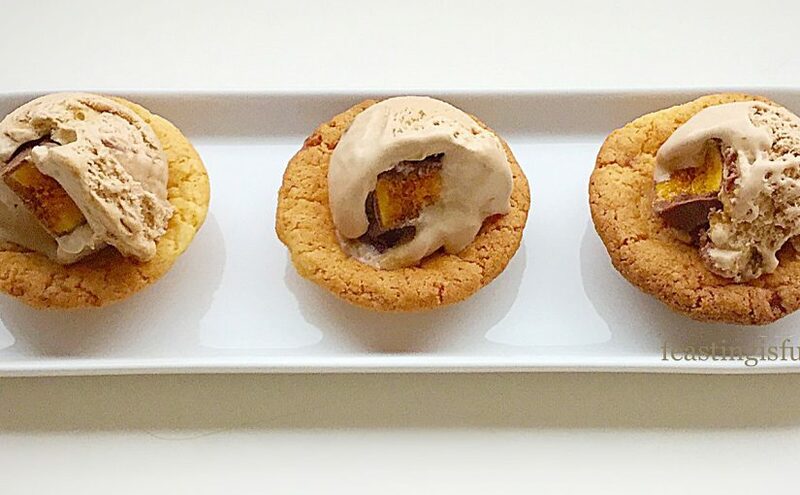 Toffee Cookie Cups easily made from Wright’sBaking new cookie mix. Tasty toffee flavoured cookies, with pieces of real toffee in the dough, shaped into cups for you to add a scoop of your favourite ice cream! 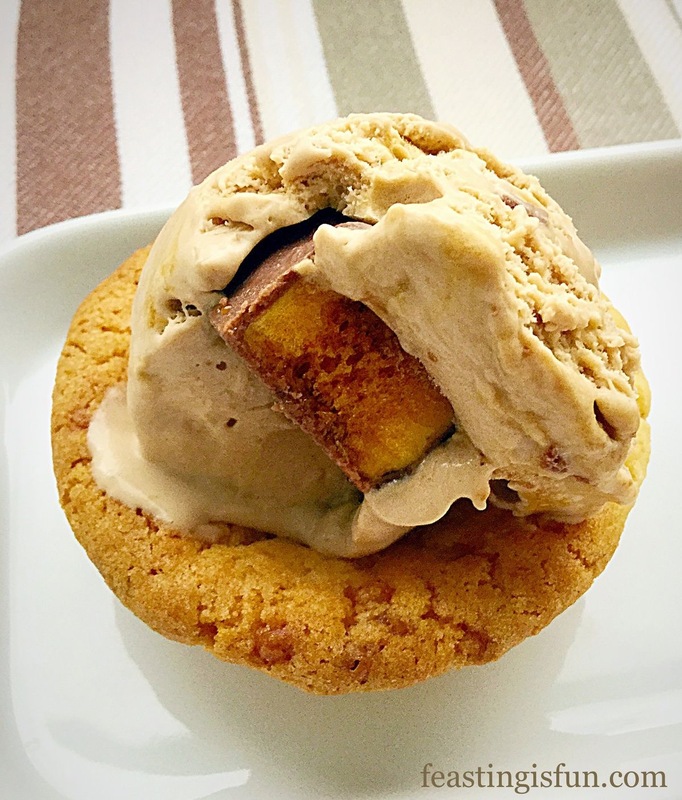 Toffee Cookie Cups great with Chocolate Honeycomb Ice Cream. 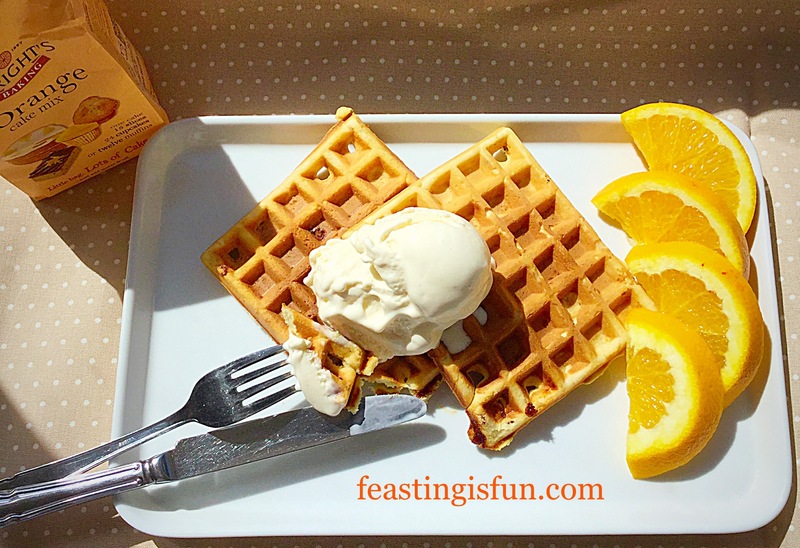 It is a well established fact here on Feasting is Fun that there are two things I am passionate about. Sharing is integral to who I am as a person and I genuinely believe that food really does taste better when shared. Also I love cookies. Not just – oh ok I’ll bake a batch – I really love cookies. 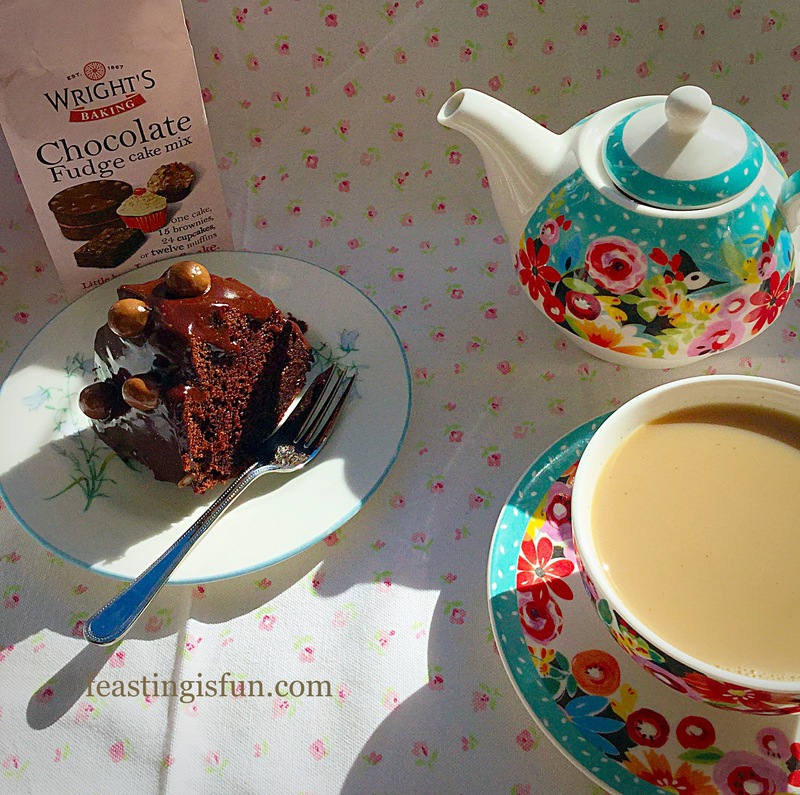 I start almost everyday with a cup of tea and a cookie or two, so when Wright’s sent me their new Toffee Cookie Mix, well I was ridiculously excited! After a little discussion with Deb-the-bread, Wright’s very own jewel in their crown, I decided to have a go at making the new cookie mix into cookie cups. Let’s just be clear on something, I had never baked these cookies before. Never having attempted to bake cookie cups before this was a first. 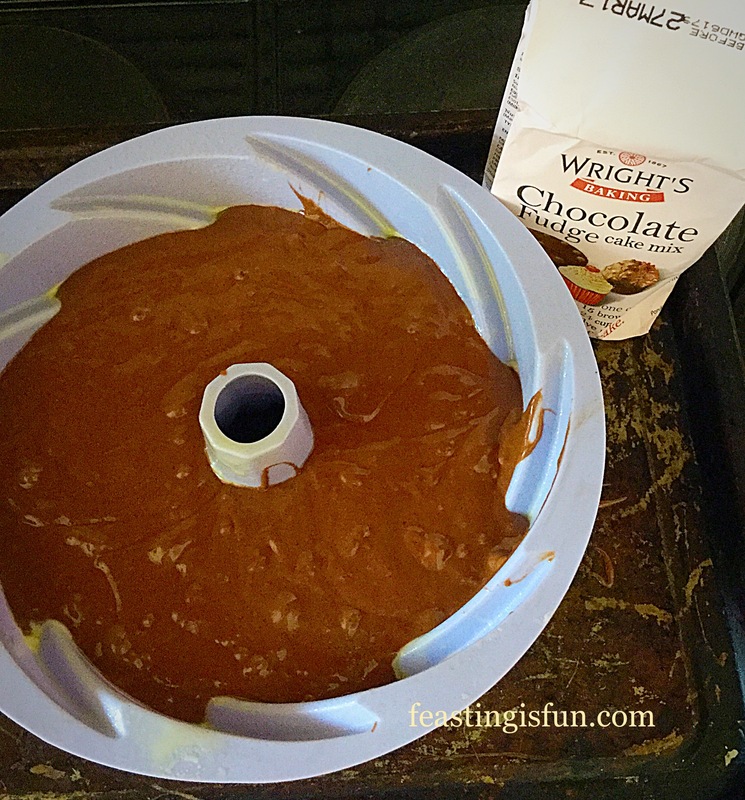 Since I had never baked a Wright’s cookie mix before – because I couldn’t, this IS their first cookie mix. Due to the Toffee Cookie Mix only just having been released, stocks were super low and there wasn’t a spare mix for me to practise with! Ok so we all know I love a challenge. Time to put my trust in Wright’s reputation for making fabulous mixes and my ability to ‘wing it’! I mean I have baked a fair few thousand cookies in my lifetime. Toffee Cookie Cups – a resounding success. 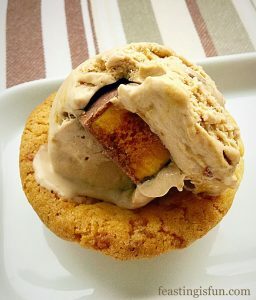 As you can see from the photos, I not only managed to make Toffee Cookie Cups, using Wright’s new Toffee Cookie Mix, they are also the perfect size for one scoop of ice cream. 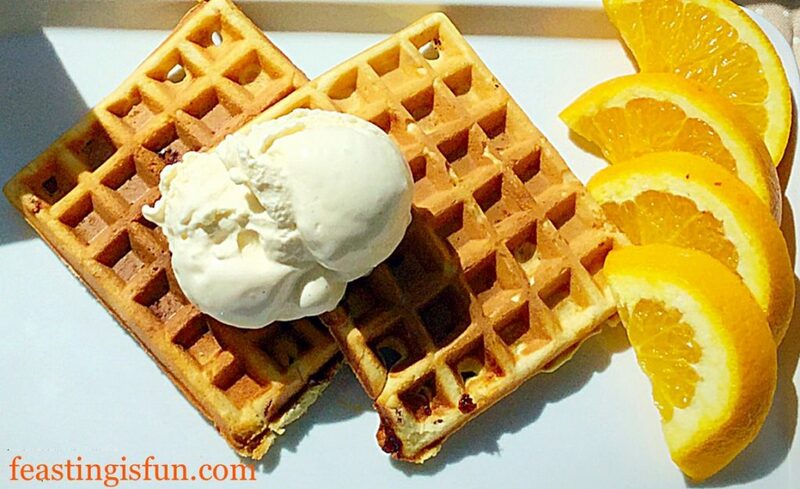 Easy to pick up with your hands and eat. 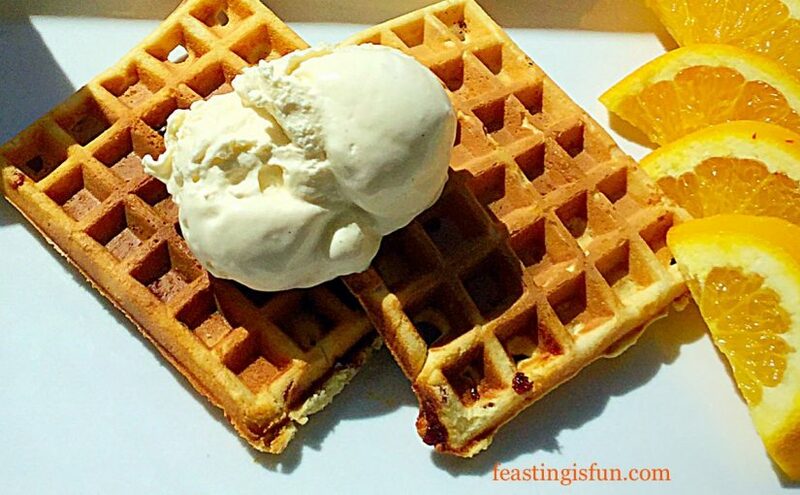 Similar to an ice cream cone, except if the ice cream drips it is caught in the cup shape. I cannot begin to explain how thrilled I was that I’d made cookie cups. Ridiculously so. More than that though, they taste ooh so good. I filled ours with Chocolate Honeycomb Ice Cream. However, you could use coffee, caramel, chocolate, banoffee, in fact any flavour that pairs well with toffee would work well in these gorgeous cookie cups. Enough waffling you want to know how they’re made and I’m desperate to share how I made them with you! 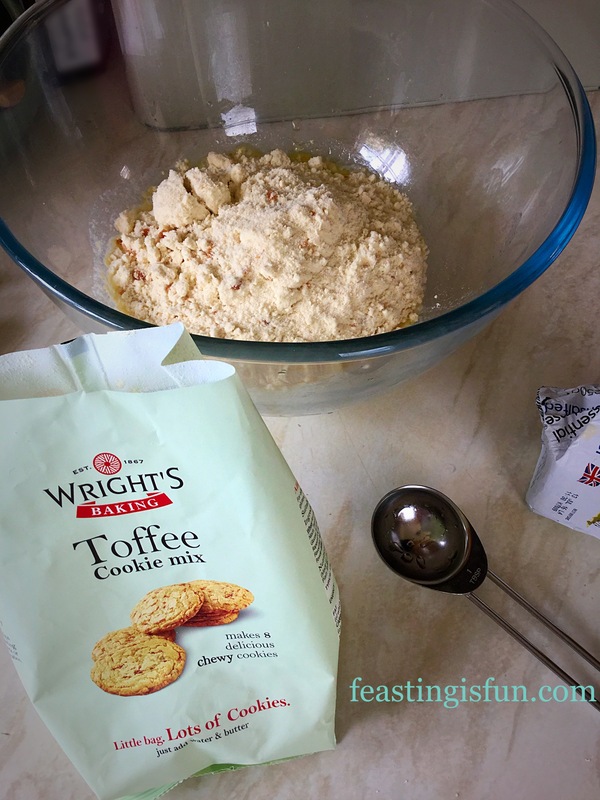 1 Packet of Wright’s Baking new Toffee Cookie Mix – Note if you cannot get hold of the mix use my Caramac Caramel Cookies recipe. 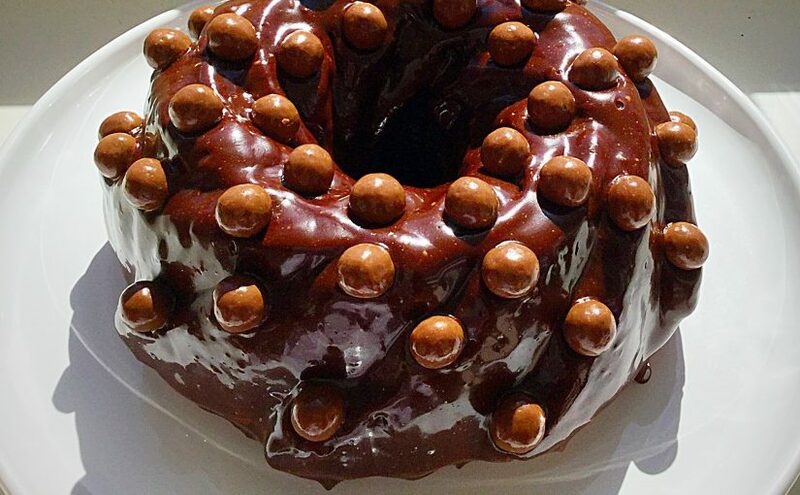 Cake release spray, oil or butter for greasing the bun tin. Method: Preheat the oven to the temperature recommended on the packet. 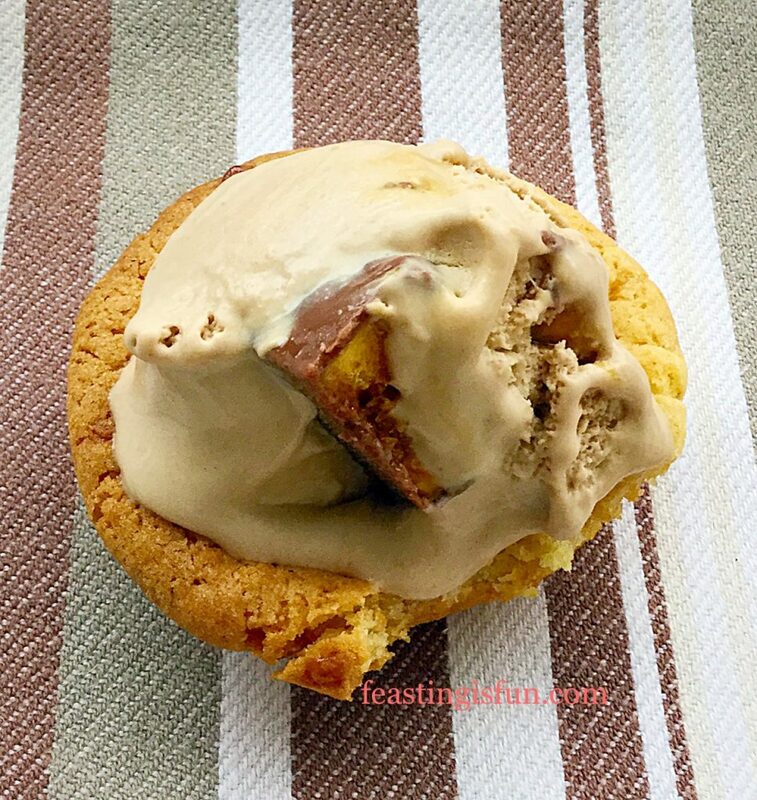 To make these Toffee Cookie Cups you will need a regular 12 hole fairy cake – NOT MUFFIN – tin. I find it is always better to have everything I need to hand before I start baking. 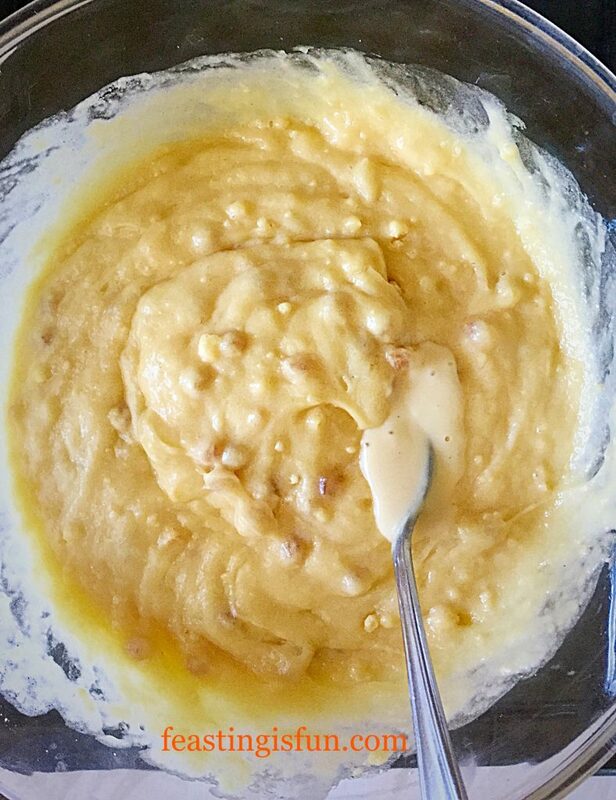 Make up the Toffee Cookie Mix according to the packet instructions – I actually melted the butter. Stir to combine the cookie mixture. Grease all of your fairy cake tin, not just the holes – I used cake release spray as I wanted to be sure these wouldn’t stick, I would advise brushing the whole tin lightly with vegetable oil. Divide the cookie dough into 10 equal-ish sized balls. The dough ball size and pressed out cookie cups. 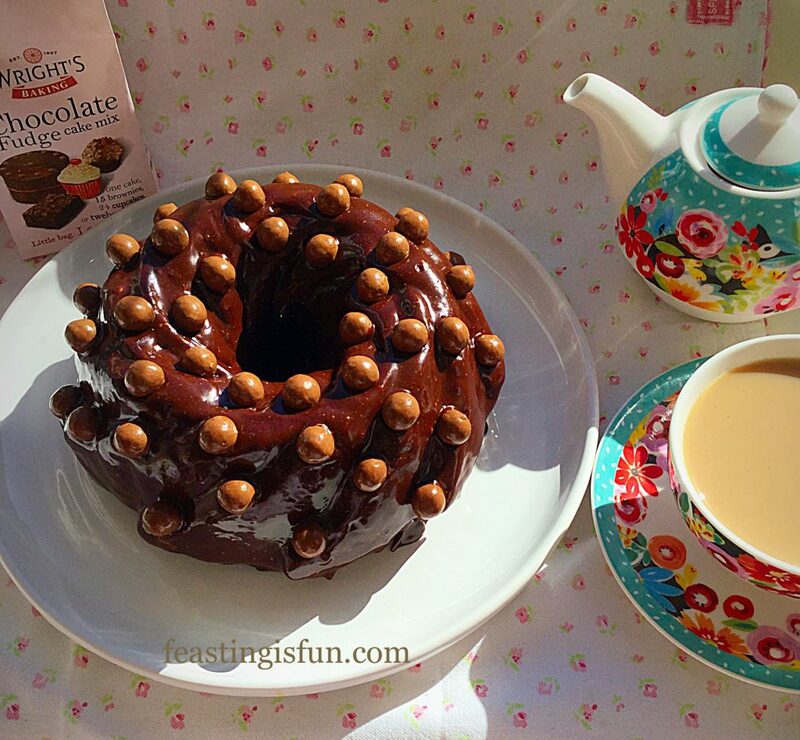 Place a cookie dough ball into one of the fairy tin holes. 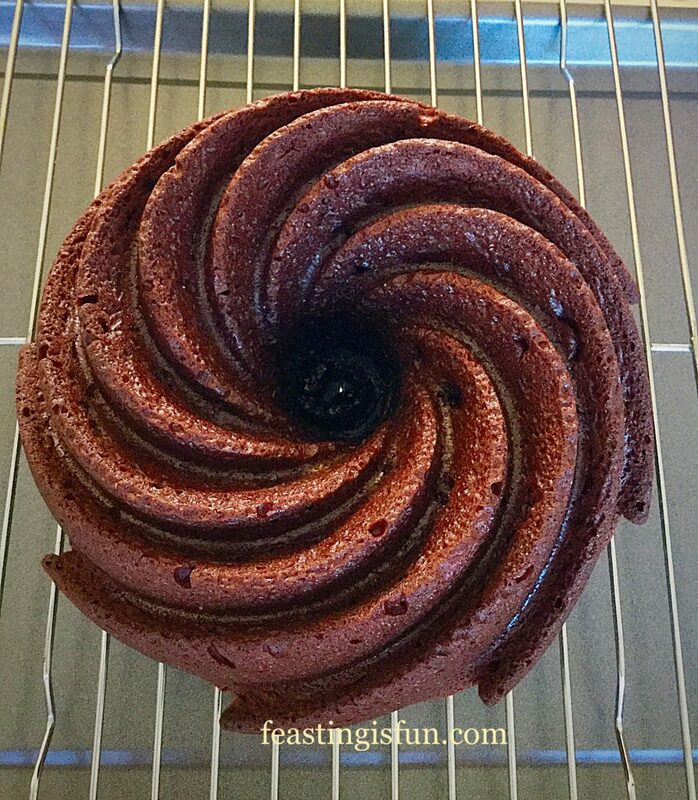 Gently with your fingers press it into the hole and sides so that it is equal thickness all the way around. 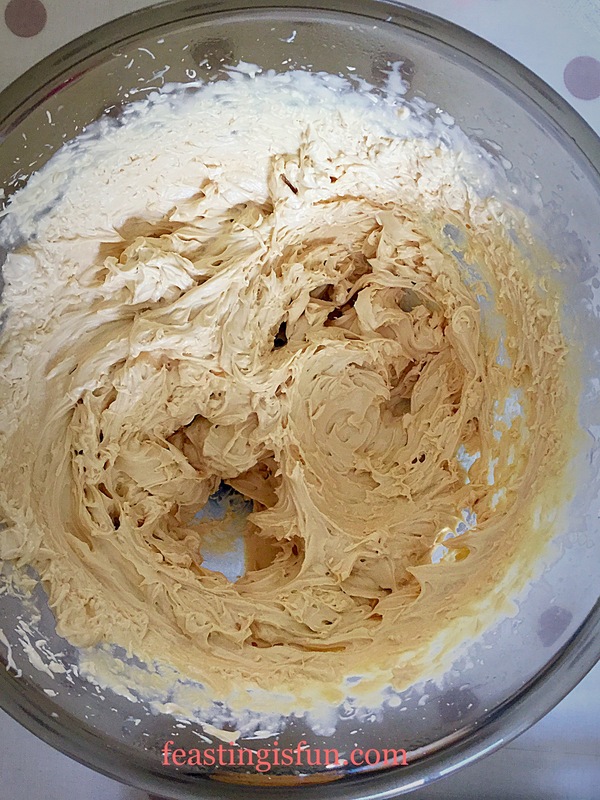 Ensure that you press the dough into the bottom of the tin so that it has a definite base. Continue for the remaining cookie dough balls. When all the cookie cups have been moulded place the tin in the middle of the oven and bake for 12-14 minutes. Mine took 14 minutes. The Cookie Cups will puff up whist cooking DON’T PANIC!! 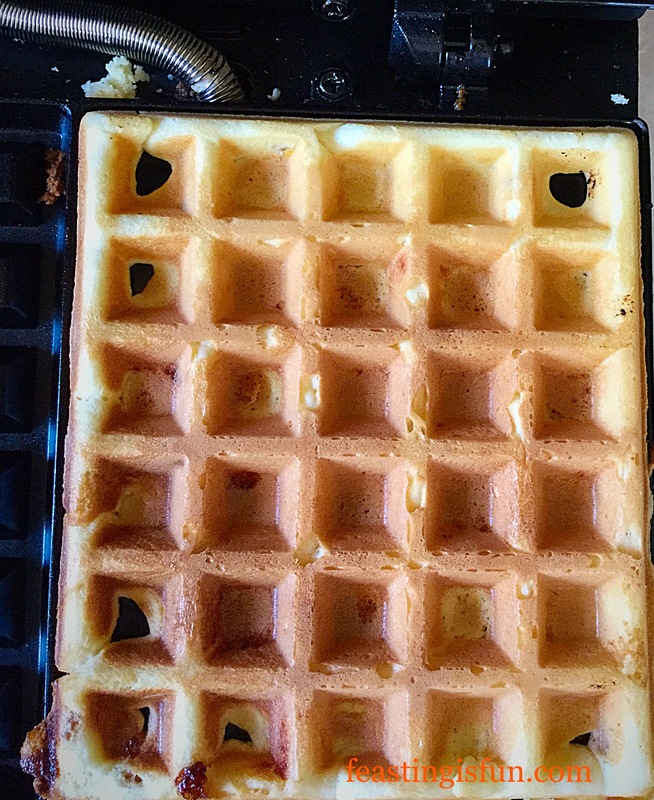 When golden brown and baked remove the tin from the oven. Beautifully golden with a wonderful toffee smell, Toffee Cookie Cups. Place the tin on a cooling rack and allow the cookie cups to cool in the tin as the cookies/cookie cups harden on cooling. 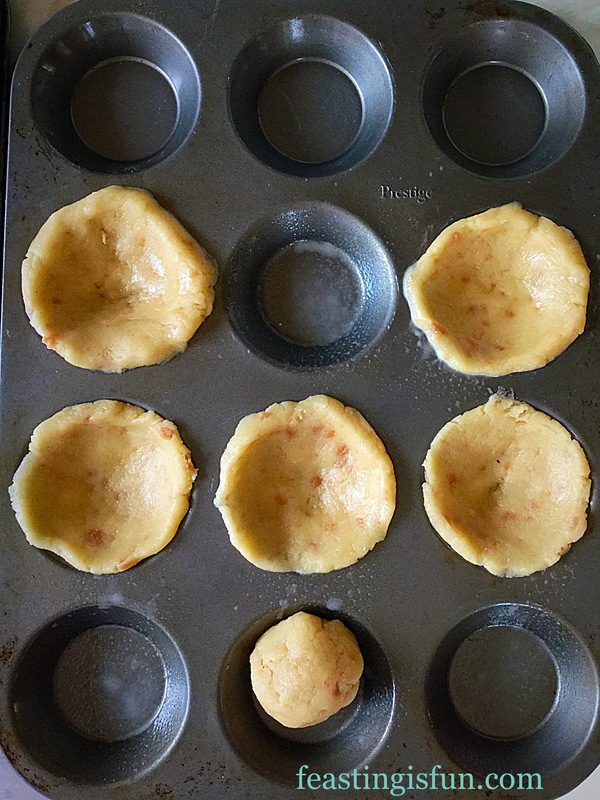 As the cookie cups cool slightly, very gently press the slightly puffed up base down. Once the cookie cups are cooled remove them from the pan – mine came away easily, if yours are proving stubborn use a small palette knife to run between the top of the cookie cup and where it lays flat on the tin, this should loosen them. 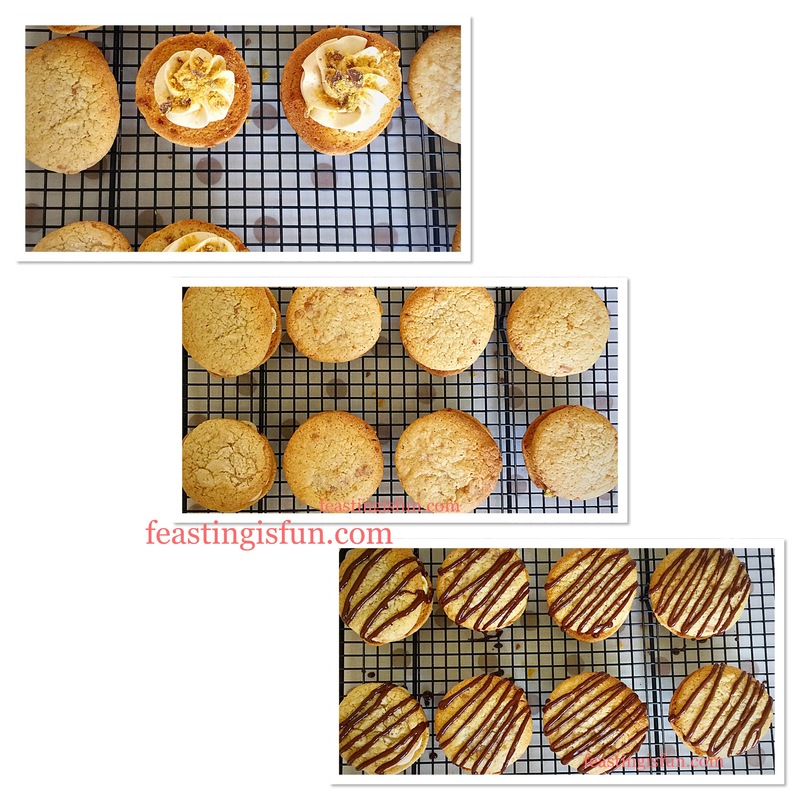 Congratulations you have made 10 fantastic Toffee Cookie Cups! To serve, add a scoop of your favourite ice cream, share and enjoy. Toffee Cookie Cups already tasted by me!!! Such an easy yet fantastic way to enjoy Wright’s new Toffee Cookie Mix. I have a couple more ideas but I will have to wait for more stock. The Toffee Cookie Cups keep for up to 5 days in an airtight container. These Toffee Cookie Cups are a fun and delicious way to eat ice cream anytime of the year, but especially when it’s hot and we all need a little cooling down. 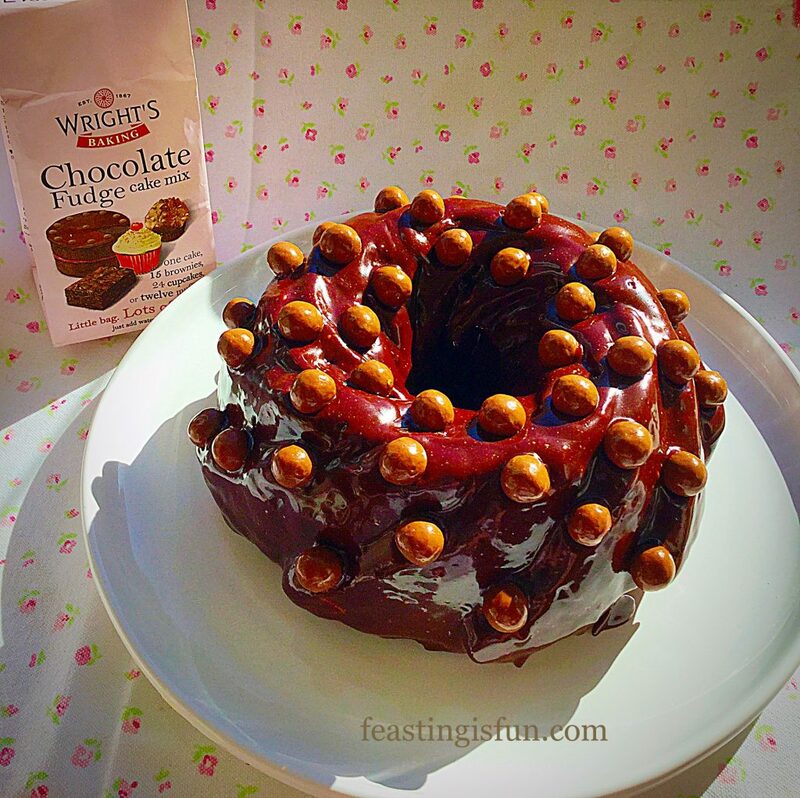 Whatever you are making and baking in your kitchens I hope you are having fun and remember to stash a couple of packets of Wright’s Toffee Cookie Mix in the cupboard. They take under 20 minutes to make and bake and are perfect for unexpected guests, or for when the urge for great cookies hits! Wright’s Baking sent me a packet of their new Toffee Cookie Mix to try. I was not paid, or even asked to write this post. All opinions, views, content and photographs are my own. Please see my Disclosure Policy.